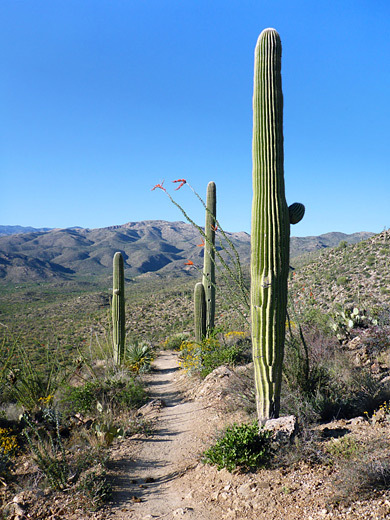 Most trails in the east section of Saguaro National Park criss-cross the cactus plains within a few miles of the park boundary, at the foot of Tanque Verde Ridge. Two longer routes climb into the high country; the Tanque Verde Ridge Trail, and the slightly less popular Douglas Spring Trail, both of which eventually reach cool, forested land above 6,000 feet, very different to the hot, exposed terrain at the lower elevations. 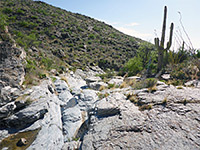 Of the two trails, Tanque Verde Ridge has generally better views as it runs for most of the way along the crest of the ridge, but Douglas Spring has the added attractions of several small streams, which form seasonal pools and a waterfall. The two trails encounter a great range of plants including many types of cacti and wildflowers, giving way to yucca, ocotillo, and sotol at the middle elevations, then oak woodland above 5,000 feet. 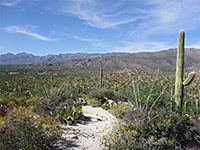 The scenery is more varied along the Douglas Spring Trail as it alternates between slopes, ravines and flatter areas, and while not many people walk the full distance, 8.8 miles to Cowhead Saddle on top of Tanque Verde Ridge, the lowest few miles are quite popular. Intermediate destinations include the edge of the hills after 0.7 miles, a stream and pools after 1.7 miles, Aguila Corral (at the upper edge of the cactus belt) after 2.6 miles, Bridal Wreath Falls after 2.9 miles, and Douglas Camp Spring and a primitive campsite after 6.5 miles. The elevation gain, while steady, is never too steep, so the trail is not particularly difficult, except perhaps in the hottest periods of summer. East section of Saguaro National Park, topographic map of the Douglas Spring Trail. 15 views along the Douglas Spring Trail. The Douglas Spring Trail starts at the east end of Speedwell Boulevard, a busy road for most of its 22 miles across the middle of Tucson, but not so hereabouts. The road is signed 'Dead End' several times over the easternmost 2 miles; beyond the trailhead it bends to the north and enters private land of Tanque Verde Ranch. A notice at the trailhead announces this is a fee area, but there is no pay station, though the place is regularly patroled by park rangers. A picnic ramada overlooks the parking lot and the mesquite trees that compromise the majority of the surrounding vegetation. If the parking lot is full there are plenty of overflow spaces along nearby verges. The Shantz and Wildhorse trails start 700 feet back down the road, but the Douglas Spring Trail is the only route beginning from the parking lot, heading east through the mesquite trees, which mingle with large saguaro cacti. The foothills of Tanque Verde Ridge are less than one mile ahead, split in one place by a prominent, rocky ravine, to where the path leads. The initial section is mostly level, passing through the bushes, and past a register just before the first of several signed junctions (all are on the south side), this with the Garwood Trail. Several wildflower species grow abundantly, most widespread being desert senna. 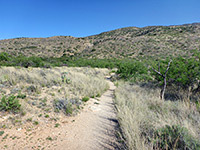 The path crosses an open, less overgrown area, followed by a sandy dry wash, and reaches the second junction, with the 0.6 mile Converse Trail. Ahead, the land rises slightly to a low, white rock ridge adjoining a larger drainage (the ravine visible from the trailhead), right at the edge of the mountains. The trail gains height via stone and wood steps, veering east at one point to an overlook above the drainage, which has become enclosed in quite a deep, rocky canyon, often containing a flowing stream, or residual pools. The valley sides are steep, sheer in places, so scrambling down is not easy. More climbing takes the path over the brink of a flattish basin and onto the third junction, on a minor saddle, with the Carrillo Trail which heads southwest, traversing the foothills and eventually (after 3.6 miles) intersecting the Squeeze Pen Trail. Ocotillo are now quite abundant, the saguaro noticeably fewer in number. 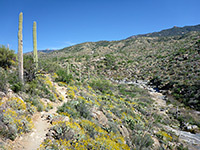 The Douglas Spring Trail descends briefly, down to the bed of the wash that forms the canyon below, an often moist area with shallow pools, lined by seep monkeyflowers, Arizona centaury and other colorful plants. 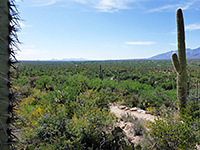 It moves along the north side of the streamway for a while, climbing more stone steps, and giving some of the best views - the vegetation is especially varied, and the V-shaped valley frames the distant Tucson suburbs to the west. The path ascends to an expanse of light grey slickrock either side of the creek, with more pools and flowers. 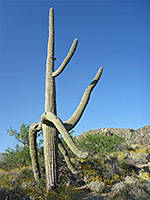 The surrounding hills now have very few saguaro, and are instead covered by scattered palo verde, sotol and ocotillo, around 3,600 feet elevation. The fourth south-side junction is with the Three Tanks Trail, which meets the Carrillo Trail after 1.5 miles. Ahead, the land is flat, grassy and bushy, and after three minor dry wash crossings, the trail reaches a four-way intersection, beside the site of Aguila Corral. To the left (northwest), Ernie's Falls Trail crosses the park boundary after 0.6 miles and continues into the Coronado National Forest, while to the right (southeast), a short spur leads to Bridal Wreath Falls, this a seasonal waterfall above a short section of wooded canyon, and the destination for many day hikers (2.9 miles from the start). The Douglas Spring Trail is straight on, crossing the streamway below the falls, and staying level just a little way further, to the edge of the grassy basin, where the next major climb begins. In another mile the path comes close to the stream again, a short distance above the falls, then traverses manzanita-covered hillsides to the north, after a while reaching the first patches of woodland. The terrain flattens out around 4,600 feet, and after some easy walking, the path reaches the usually dry Douglas Camp Spring, and the adjacent primitive campsite. The final 2.3 miles is consistently steep, gaining another 1,600 feet while heading due south along a ravine, to the crest of Tanque Verde Ridge at Cowhead Saddle, where other paths continue west, south and east.